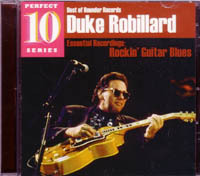 Liner Notes: Duke Robillard is one of the great guitar masters of our time, adept at styles that range from rock to swing, but always with the blues at the heart of his music. After founding the band Roomful of Blues, Duke struck out on his own, and these are among the first recordings he made with his stripped-down trio that put the focus clearly on his guitar and songwriting. Included are three songs previously unavailable on compact disc. Rounder Perfect 10 Series.